Danny Lennon says he wants the 21-year-old to provide competition to Craig Samson. 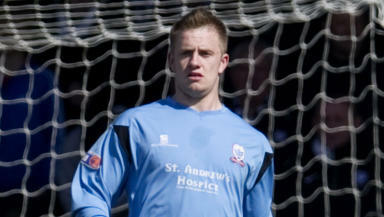 Danny Lennon is hoping to conclude a deal for former Rangers goalkeeper Grant Adam by the end of the week. The Scotland Under-21 international has been on trial with St Mirren throughout pre-season, as the Buddies seek a number two to Craig Samson. With continued uncertainty over money from broadcasting contracts with the SPL, Lennon is unwilling to stretch his budget to bring in Adam. But the manager says he is keen to sign up the 21-year-old if finances allow. "If the price is right and it suits us then we’ll sign Grant," Lennon told the Daily Record. "I need a goalkeeper and Grant ticks a lot of the boxes. "We kick off in a couple of weeks and while we’ve other things up our sleeve he’s one we’ve put a lot of time into. "I’m sure Grant doesn’t want it dragging on and I hope there’s a closure to it one way or the other by the end of this week. "I’ve always said we won’t go outwith our means. We value Grant and he’d give us a good option but we are in a financially uncertain period."